JURUNATURE's insulation division is a professionally organized division within the company, mainly dealing with the oil and gas sector. The company uses only quality materials and personnel, to ensure that the customer receives the best service possible. With an established reputation for timely finishes, within budget and to the correct specifications, our clients have shown their satisfaction with repeat business. Our insulation service provides the full range of insulation services and materials for heat conservation, cold conservation, personnel protection and acoustic insulation. Having the full range of materials to meet the client’s specifications. We provide design, engineering, supply and installation services for all types of insulation. We have carried out several projects, both on and offshore, and have helped improve designs of some of the client’s insulation systems. As can be seen in the pictures, our Personnel Protection (P2) wire mesh type insulation is unique. Though using more expensive materials (SS316 only), the quality and life expectancy are vastly increased. The design is our own, in accordance with, and accepted by, EMEPMI specifications. For our Passive Fire Protection (PFP) services, we supply and apply the material for piping, vessels, equipment, bulkheads and structure. For items requiring maintenance, we can provide removable PFP casting for items such as valves and flanges. Our PFP product is an intumescent epoxy passive fire protection material, manufactured in the United Kingdom. The material is BOMBA approved, LLOYDS registered, DNV and ISO 9002 certified. The protection rating provided is determined by the thickness of the PFP application, plus the thickness and type of material it is covering. The PFP thickness is also determined by the fire protection rating requirements of the client. Protection up to JF120/H120 can be provided, by both our wet application and casting type PFP systems. The pictures show some of the castings provided for the main SDVs for the Nippon Oil Helang platform and the Talisman Bunga Raya platform, which we recently completed. As the castings are fully removable, and reusable, maintenance and inspection of the items can be carried out with little inconvenience. Where wet application is used, PFP cast access panels can be fitted to pipes, vessel body and other structures, to allow for inspection for under insulation corrosion etc. 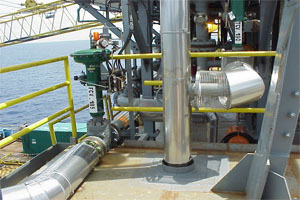 H2 pipe and flange covers. Our insulation service includes the design, engineering, supply & installation of quality products to meet the customer’s needs. We can provide standard and more specialised materials as required. Mostly, we have provided Calcium Silicate, Rockwool and Celluar Glass types of insulation. All types fitted with vapour and/or moisture barriers as required by the client’s specifications. Our jacketing used as mainly been SS316, but other types are available for cost cutting purposes. Our efficient staff have always completed projects within budget & on time. Most work has been offshore, but we have also done onshore work as well. All our workers are safety trained for both offshore (with HUET) and onshore work. The workers are also regularly tested for drug and alcohol, to meet our and our client company rules and regulations. When maintenance and inspection of components is required, we provide reusable, removable insulated boxes. H2 Valve & Flange Boxes. P2 ‘T’ and valve covers. Our unique personal protection design, developed along the specifications required by EMEPMI, is a sturdy long lasting system providing the safety solution intended for it. The use of only SS316 material gives the long term durability to the system. SS304 can be used, but will not have quite as good long term endurance, but will save on initial costs. We use steel sheet to provide neat and secure finishing at ends, around valve collars etc. The use of full pipe clamps, insulated by Teflon strips, gives good solid support. In conjunction with the full flat bar framework, a rigid system is provided which will withstand most accidental knocks and bangs. Damaged items are easily replaced as all items are individually built. Fitting is by SS nuts and bolts only, thus making removal and refitting very simple. Trained, skilled & efficient staff. All types of insualtion work provided from one company. Onshore and Offshore projects undertaken by experienced staff. In-house quality procedures tailored and adapted to suit client’s needs. Safety concious workforce complimented and awarded for their Zero LTA and cleanliness of work areas. Portable equipment kept in stock for quick deployments. Experienced site- stringing teams get fast and accurate results, to reduce installation time and rework. Excellent quality of materials to provide long lasting solution to problem. Easy and fast installation and removal. Neat and clean finish, with no burrs, provides better personal protection. Robust system to withstand normal interferance from accidental knocks and bangs. To the left here, we see where some H2 and P2 insulation meet at a ‘T’ junction, and shows a P2 elbow. To the right is some P2 insulation covering some valves, reducers and flanges. Note the neat look of the steel plate finish around the valve collar. 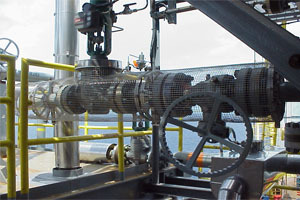 P2 Personnel Protection InsulationR03; covering a valve on an EMEPMI platform. A closer look at the P2 insulation on the valve, note the flat bar frame and steel plate finishing around the valve collar. More P2 insulation, showing the steel plate ends where the valve cover overlaps the pipe insulation, giving a neat finish and extra rigidity. All pipe and flange clamps are insulated from the heat of the pipe by a 3mm thick Teflon strip. Valve cover ending, and joining, a ‘T’ junction. P2 insulation, covering some flanges, reducers and valves. Note the neat steel plate finish around the valve collar. H2 and P2 insulation meet at a ‘T’ junction, and shows a P2 elbow. H2 (heat conservation) insulation, covering pipe, elbows and flanges. The flange boxes are fully removable and reusable. H2 insulation covering pipe, elbows, ‘T’s and flanges. H2 insulation an elbow, valve and flange. The flange cover is sealed to the pipe at this end, with high temp silicon sealant, as this is the extent of insulation required. H2 insulation, the central section shows a flow element cover. Note that the valve operating mechanisms are free to operate.